October 3, 2017 — Remember that time Jessica Fletcher went psycho? 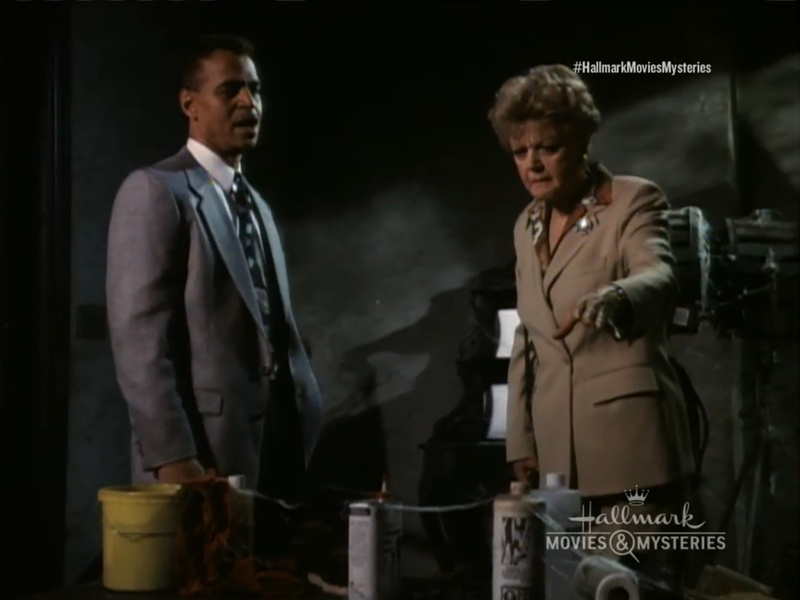 I’m not talking about the theory that the star of Murder, She Wrote was really a serial killer, despite how much absolute sense that theory makes. Why did somebody die everywhere this middle-aged novelist went? On vacation? Dead body. Work trips? Dead body. Visiting relatives? Dead body. And then there was the little matter of her small, idyllic home town of Cabot Cove, Maine, which boasted more murder victims than actual residents. No, I’m not talking about that. 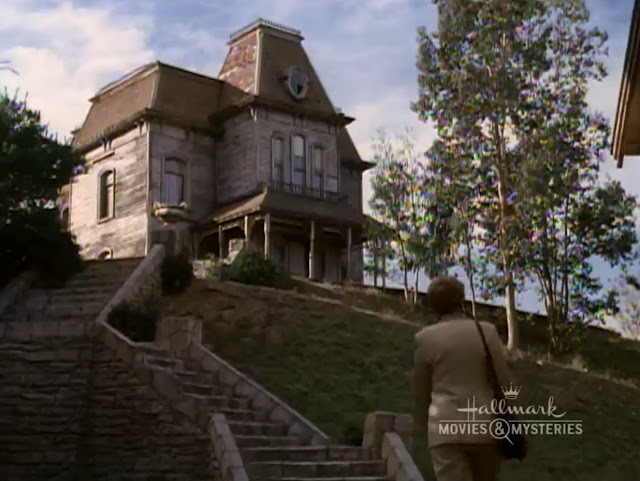 I’m talking about the time that Jessica Fletcher found herself in Norman Bates’s home stabby home. The Psycho House. It’s the most ominous, evocative, atmospheric building in all of cinemadom. It’s inspired four movies, a TV pilot-turned-movie, a TV series, a party with Elvira, an episode of Knight Rider. And an episode of Murder, She Wrote—the best series title that’s ever filled the little rectangle boxes inside old TV Guides. Debuting in January 1992, the episode is called, innocuously enough, Incident in Lot 7. It’s episode 13 of season eight and written by J. Michael Straczynski, the guy who gave us many of the best The Real Ghostbusters episodes and the mastermind behind Babylon 5. It starts out perfectly. Fletcher, a famous mystery writer, has had her latest book, The Messengers of Midnight, optioned by a studio and comes to Hollywood, with all the clichés that entails: Instrumental audio of Hooray for Hollywood, costumed character-filled back lots, and, of course, limos. And out of the first limo we see, the on driving onto the Universal Studios lot, pops Mrs. Fletcher. 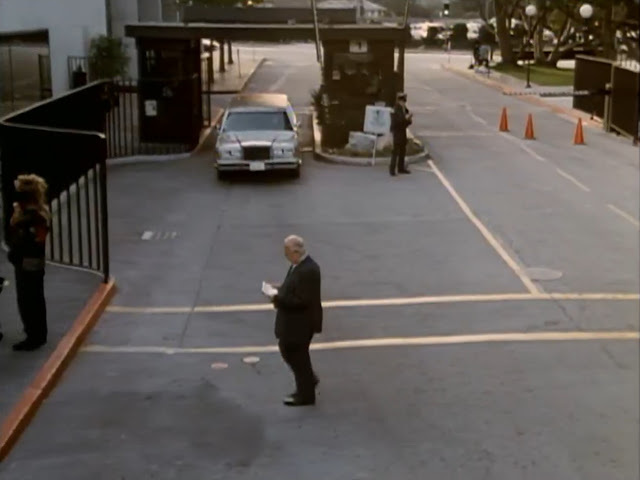 Suddenly the music changes to the theme from Alfred Hitchcock Presents and a suspiciously rotund man in a suit crosses the street like he’s just some ordinary extra. It was going to be this kind of episode. A few Cylon cameos later, and we’re in the middle of a sordid tale of a sleazy movie executive being a sleazy movie executive, the kind of guy who has an affair with a woman to get her husband’s financial backing, and then breaks up with her with this speech: “Things change. You know Darwin? Evolve or die? We’ve had our fun, now we emerge from the sea, we lose our gills, grow opposing thumbs, get on with our lives.” It becomes pretty obvious pretty fast who’s playing the eventual murder victim in this story. Meanwhile, Jessica is mostly concerned with this young script writer in glasses and suspenders who wants to insert car chases and explosions into her elegant little mystery story. Holy cow, I hope so. 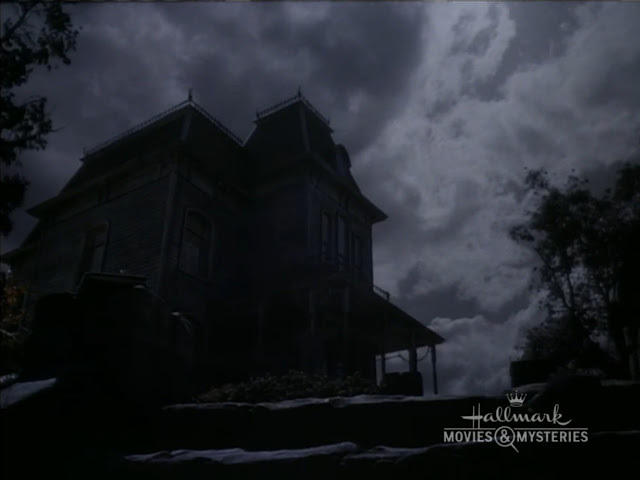 They don’t skimp on the Psycho House in this episode. It’s no mere insert shot. It appears almost as often as Jessica herself and, of course, eventually ends up being the murder scene of the executive-who-had-it-coming-hard. 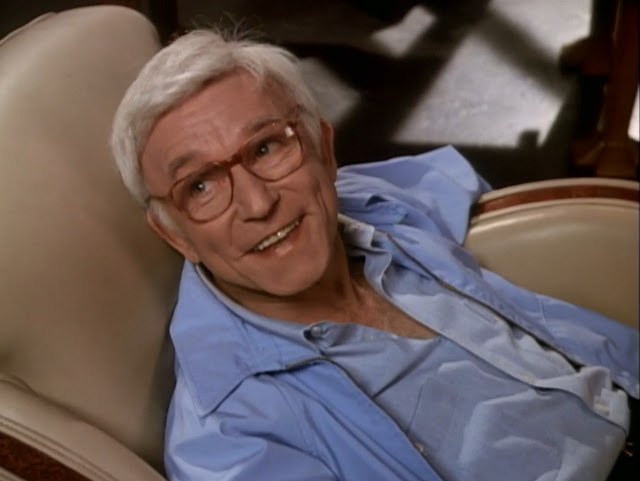 I’m not going to spoil the episode for you, but it involves a red herring psycho character played by the delightful Henry Gibson, who is most known to me for play a non-red herring psycho in The ’Burbs, and it also features Ron Glass of Firefly fame (at least to me) as an investigating officer beaten the punch by Jessica. The best part in the whole episode is when Jessica Fletcher reenacts a couple of the scenes from Psycho itself inside the Psycho House itself. 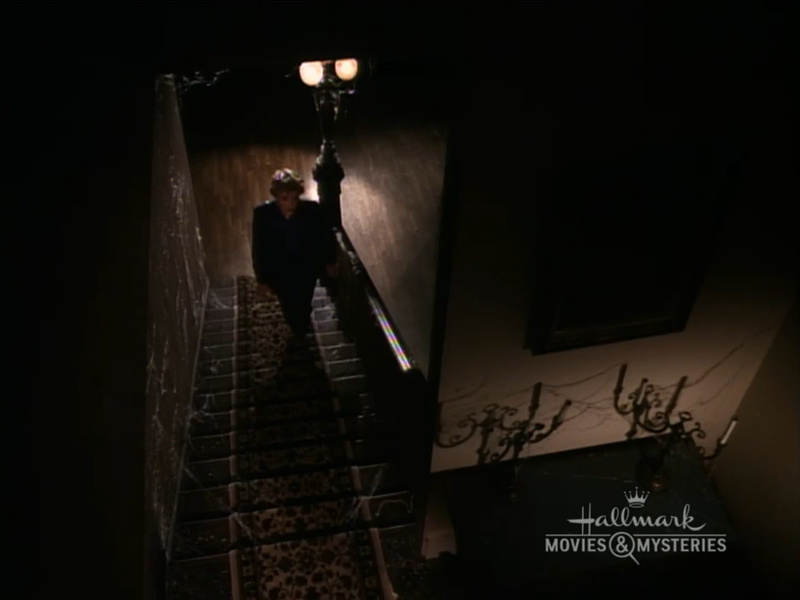 She slowly walks up the steps in the same framing as Arbogast’s death scene (they’re both detectives, after all), and then there’s the riff off the shower scene. With Jessica Fletcher. 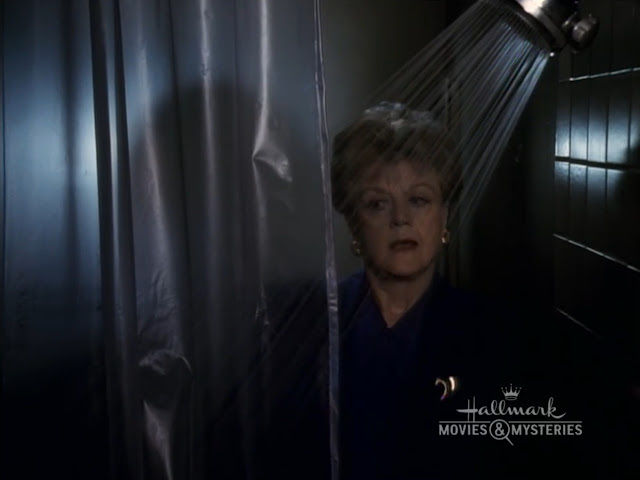 She doesn’t get into the shower, of course, but that’s where the reveal takes place, as she shows us how she solved the mystery half an hour ago and then gets ready to move on to the next place where she’ll kill again and pin it on some unsuspecting dupe. It’s like Jessica and the Psycho House were made for each other.